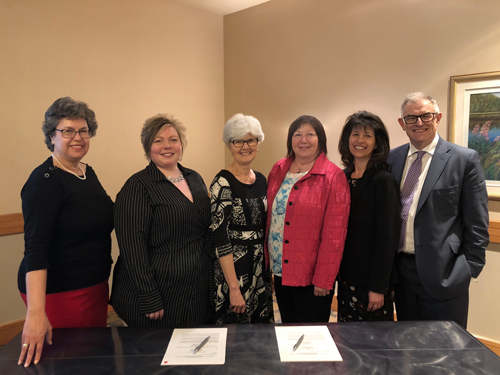 In early May 2018, Speech-Language & Audiology Canada (SAC) announced that it had reached an agreement with the Canadian Alliance of Audiology and Speech-Language Pathology Regulators (CAASPR) to develop and administer Canada’s first entry-to-practice exam for speech-language pathologists and audiologists. Representatives from SAC and CAASPR at the official ceremony to sign the service agreement. Please click here to read SAC's Official Statement. Please click here to read CAASPR's Official Statement. "I don't think that I've ever been prouder of SAC, than I am in this very moment." - Feedback from an SAC member regarding SAC's Official Statement. SAC and CAASPR have prepared a joint document to respond to questions regarding the Canadian Entry-to-Practice (CETP) Exam and SAC Clinical Certification. Please click here to download the entire FAQ document. Q: What is the difference between Speech-Language & Audiology Canada (SAC) and The Canadian Alliance of Audiology and Speech-Language Pathology Regulators (CAASPR)? A: As a member and associate driven national professional association, SAC advocates for you, as a communication health professional, regarding relevant issues in the professions. We offer members and associates a range of continuing education opportunities, as well as professional liability insurance and other benefits tailored to you as a professional. Through our advocacy efforts, SAC raises public awareness about the importance of communication health and the role of speech-language pathologists, audiologists and communication health assistants. SAC represents the needs of communication health professionals across Canada, giving us a strong national voice when advocating on behalf of the professions, in addition to representation at the table for various international projects. CAASPR is the national coalition of the eight provincial regulatory bodies for audiologists and speech-language pathologists. Provincial regulatory bodies act in the best interest of the public and do not advocate on behalf of the professions. The alliance members work together on matters which support the regulatory mandate of each provincial jurisdiction to protect the public interest. Q: What is the Canadian Entry-to-Practice (CETP) Exam for Audiologists and Speech-Language Pathologists? A: The CETP Exam is a national, standardized, competency-based entry-to-practice exam for speech-language pathologists and audiologists. It is a regulatory exam based on the competency profiles and sub-competencies recently developed by CAASPR for the purpose of regulation. The first CETP Exam is scheduled for fall 2020 and more information will be provided in the lead up to the first exam sitting. Q: What is the purpose of the CETP Exam? A: The CETP Exam is a key component of CAASPR’s Centralization and Capacity Building Project designed to harmonize the assessment of speech-language pathologists and audiologists working across regulated jurisdictions in Canada. The implementation of the CETP Exam will move the assessment process of speech-language pathologists and audiologists applying for licensure under a single body, resulting in standardized outcomes, enhanced public safety and improved labour mobility. Q: What is SAC’s involvement in the new CETP Exam? A: For several years, CAASPR has been working to develop a national, competency-based entry-to-practice assessment process to harmonize the registration requirements for speech-language pathologists or audiologists working in regulated jurisdictions in Canada. A key component of this project includes the implementation of a national, standardized, entry-to-practice exam for the professions of speech-language pathology and audiology in Canada. SAC recently signed an agreement with CAASPR to administer the CETP Exam on CAASPR’s behalf beginning in 2020. Q: How will the CETP Exam differ from the SAC Clinical Certification Exam? A: The new CETP Exam will have similarities in style, format and length to the current SAC Clinical Certification Exam. The content of the CETP Exam, however, will be based on CAASPR’s newly developed national competencies and sub-competencies. Q: Will CAASPR have requirements for licensure in addition to passing the CETP? a professional master’s degree from an accredited Canadian university program*, or a non-accredited program that meets the same academic and course requirements. proof of language proficiency (by exemption or successful score on the accepted test). Once registered, continuing education requirements will continue to be defined by individual jurisdictions as per the Agreement on Internal Trade (AIT) and the Canada Free Trade Agreement of July 2017. Please note that the AIT allows individual provinces to require “additional training, experience, examinations, or assessment requirements if an applicant does not meet their currency requirements.” Continuing education, however, is generally more applicable to Quality Assurance requirements, rather than entry to practice. *The Council for Accreditation of Canadian University Programs in Audiology and Speech-Language Pathology (CACUP-ASLP) accredits Canadian university programs. Q: Which provinces/territories are regulated and which are unregulated? Note: Unregulated provinces that choose to establish a regulatory body in the future will determine the initial licensing criteria at the provincial level, at the time of inauguration. Q: Who will need to write the CETP Exam? all new graduates from speech-language pathology or audiology programs (Canadian and international) who apply for licensure in a regulated province will be required to write the CETP Exam (with the exception of Quebec, due to provincial legislation). unregistered speech-language pathologists or audiologists seeking licensure in a regulated province will be required to write the CETP Exam to qualify for licensure. This would apply, for example, to a professional who is moving from an unregulated jurisdiction to a regulated one, regardless of their professional experience. eligible speech-language pathologists or audiologists (including new graduates) working in or planning to work in unregulated provinces will be able to choose whether they wish to write the CETP Exam. The length of time that exam results will remain valid for unregulated professionals will be forthcoming. Q: Who will not need to write the CETP Exam? A: Speech-language pathologists and audiologists registered with a regulatory body at the time the CETP Exam is introduced, will not be required to write the CETP Exam, regardless of where they reside or practice. Registered speech-language pathologists and audiologists will be able to move to, or work in, another regulated province without writing the exam. Because of provincial legislation in Quebec, new graduates from accredited Canadian speech-language pathology or audiology programs who are applying for licensure in Quebec may be exempt from writing the CETP Exam. Detailed information will be forthcoming and available through l’Ordre des orthophonistes et audiologistes du Québec (OOAQ). Q: I am a speech-language pathologist or audiologist working in an unregulated province. What do I need to know about the introduction of the CETP Exam? A: Speech-language pathologists and audiologists not registered with a regulatory body who wish to work in a regulated province will be required to write the CETP Exam to qualify for licensure. If you are interested in pursuing licensure, you have the option to apply to a regulated jurisdiction before the introduction of the CETP Exam in 2020, even if you do not plan to practice in a regulated province in the immediate future. In order to be registered, you will need to apply and pay the provincial registration fees. If you choose to pursue registration, you should first, consider licensure in the province where you are most likely to practice in the future. This is a personal voluntary decision and we strongly encourage you to do your own research on the requirements of each regulatory body. Note: BC and NL currently require the SAC Clinical Certification Exam results for registration. Speech-language pathologists and audiologists (including new graduates) working in or planning to work in unregulated provinces will be able to choose whether they wish to write the CETP Exam. The length of time that exam results will remain valid for unregulated professionals will be forthcoming. Q: I am a student who will graduate before the CETP Exam is implemented. Will I still be able to write the SAC Clinical Certification Exam? A: Yes, students who are interested in becoming clinically certified or who require successful completion of the SAC Exam to practice in a province/territory are still required to write the SAC Clinical Certification Exam. We strongly encourage you to write the exam at the sitting that best fits with your academic schedule or regulatory body requirement. However, once the CETP Exam is introduced in 2020, SAC will no longer be administering an additional clinical certification exam. It is important to note that you are not required to be clinically certified to become a member of SAC. SAC Clinical Certification is an additional member designation for those members who wish to hold SAC’s highest standard of excellence in speech-language pathology or audiology. Q: I am a student graduating from a speech-language pathology or audiology program. What do I need to know about the CETP Exam? A: The first CETP Exam is scheduled for fall 2020. Once the CETP Exam is introduced, all new graduates from speech-language pathology or audiology programs (Canadian and international) who apply for licensure in a regulated province will be required to write the CETP Exam. Details pertaining to specific timelines, provisional licenses (before writing the CETP Exam), thesis students, exam re-write attempts, fees, application process, and exam preparation will be forthcoming. Q: What is the difference between an SAC member and an SAC Clinically Certified member? A: SAC members hold a master’s degree in speech-language pathology or audiology (or equivalent), have acquired 300 supervised clinical practicum hours or belong to a provincial regulatory body and have paid their SAC membership dues. SAC Clinical Certification is a voluntary program available to SAC members who wish to demonstrate a high level of professional excellence. SAC Clinically Certified members must meet additional requirements, including passing the SAC Clinical Certification Exam and undertaking ongoing professional development. Only SAC Clinically Certified members are permitted to use the S-LP(C) or Aud(C) designation. It is important to note that clinical certification is not a requirement of SAC membership. Q: Will there be value in maintaining my SAC Clinical Certification? A: Yes, SAC Clinical Certification is SAC’s highest standard of excellence in the professions. SAC Clinically Certified members demonstrate that they have achieved an additional level of professional excellence that is highly regarded and often required by many employers. As a nationally and internationally recognized credential, SAC Clinical Certification raises your profile with employers and facilitates your ability to work abroad or in unregulated Canadian provinces/territories. Q: Will I still be able to use my S-LP(C) or Aud(C) designation? A: Yes, as long as you continue to meet the requirements for maintaining clinical certification, you may continue to use the S-LP(C) or Aud(C) designation. Q: What will the SAC Clinical Certification Program look like once the Canadian Entry-to-Practice (CETP) Exam is in place? A: SAC is committed to maintaining, adapting and revitalizing the clinical certification program to meet the needs of the professions. Professional development will continue to be a key component of the program. In the coming months, SAC will engage and consult with stakeholders about how best to meet the needs of Canadian speech-language pathologists and audiologists. Q: When will changes to the SAC Clinical Certification Program take effect? A: While key dates for potential changes to the program are still being determined, SAC is committed to maintaining our clinical certification program once the CETP Exam is implemented. SAC will be working with our existing clinically certified members as well as future clinically certified members to ensure the program continues to meet the needs of Canadian speech-language pathologists, audiologists and their employers. Q: How will the CETP Exam impact employers that require SAC Clinical Certification? A: We know that employers across Canada value clinical certification because it shows that their staff are committed to going above and beyond in terms of their level of professional development and maintaining their skills as a clinician. Employers should be reassured that when the CETP Exam is implemented, SAC will continue to offer a clinical certification program. Please click here to view the National Audiology Competency Profile. Please click here to view the National Speech-Language Pathology Competency Profile.